I was at Starbucks the other evening and as I was typing away on my laptop, the guy at the table across the way waved at me. I took my ear buds out and he said, â€œwould you watch my stuff?â€ I said, â€œsure,â€ put my ear buds back in and went back to my writing. But as I sat there a thought began creeping into my mind, â€œI am responsible for this guys stuff,â€ and â€œI donâ€™t even know this guy.â€ What was in his bag? What exactly am I watching over? What if he were some kind of college terrorist? Would I be an accessory to some kind of crime? How does he know that I wonâ€™t take his stuff, or mess with his computer? I guess I need to work on looking tougher. My new bifocals, Disney t-shirt, blue jeans, and red canvas crocs set him at ease, I suppose. Just when I was getting all freaked out, he came back, waved at me, and went back to whatever he was doing before. My responsibility for this guyâ€™s stuff was over. He uses several graphic images to give a description of believers.Â Paul discusses the church being a family (the household of God), as an assembly or gathering (the church), and as pillars and buttresses. It is the later that I want to discuss with you. He confesses that â€œgreat indeed is the mystery of godliness. The mystery is not like a scene from a Hitchcock episode where the detective says, â€œHereâ€™s what happened.â€ We already know what happened. We are not left wondering if the butler did it. Instead we know who did it (Jesus), what (salvation of mankind), when (at the fullness of time), where (Calvary), and why (â€œFor God so loved the worldâ€). The part that Jesus played is not a mystery, instead it is a reference to the gospel. Another way to think about this verse is â€œGreat indeed, we confess, is the mystery of the way of godliness (the gospel).â€ Why would God do this great thing to save mankind? Why would He give His only Son for those that hate Him? Then Paul goes on to outline what Christ did and how His message has spread. But the gospel is powerful only when the truth is upheld. We are not free to change the story or what is required for salvation in any way or for any reason. The gospel was believed on in the world because it was accurately proclaimed.Â Paul has already warned Timothy of false teachers in earlier chapters, and here he is describing believers, as a whole, as being responsible for holding up the truth. He uses the architectural reference of a buttress and pillar. When walls collapse under a load they usually buckle to the outside. Therefore, a buttress is a layer of wall added to the outside of an existing wall to add support. 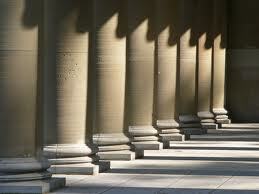 A pillar is to support the weight on the inside of a structure. So, from outside, and inside believers are to hold up the weight of truth. The weight of the truth never goes away, like the constant push of gravity. This is not just a Sunday activity; our responsibility of watching over the truth and holding it up to the lost world is a constant endeavor. The truth must be upheld when we gather together in worship, and it must be upheld when we disperse to our everyday lives. We do not worship a dead idol that only has â€œpowerâ€ in a temple, as the pagans of old believed. Instead, we serve a risen Savior, a living God, who desires that His people live holy lives for Him, and uphold His truth around the world. Like a father who leaves his family because the load of responsibility is too heavy for him, it is just as tragic when Christians twist and distort the truth of the Gospel in order to get out from under the heavy weight of truth. Both leave the family is chaos and with heartache — and for a lost world apart from Christ they are left without hope.